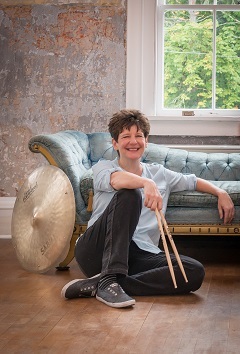 At the Deer Head Inn at lunch time on Monday, June 24, 2019, Dr. Sherrie Maricle will join CampJazz for a special Master Class on Rhythm in Jazz Improvisation. From the drum set Sherrie leads The DIVA Jazz Orchestra, her quintet FIVE PLAY and co-leads the 3Divas. From Carnegie Hall, she performs with The New York Pops and from celebrated stages everywhere, she is music director for Broadway star Maurice Hines. Sherrie is also a busy freelance performer and a published composer/arranger. Sherrie’s bands have performed at many of the world’s most acclaimed music venues and festivals; from Lincoln Center to the Kennedy Center and the Hollywood Bowl, to Jazz Festivals in Germany, France, Ireland, England, Croatia, Japan, Vietnam, Israel and beyond. Additionally DIVA was featured on the soundtrack for the NBC-Macy’s Fireworks Spectacular; on CBS Sunday Morning and TCM’s broadcast of the 25th Anniversary of the Kennedy Center. The band is also prominently featured in the award-winning documentary film The Girls in the Band. Sherrie has received several awards and honors which include a 2014 Ovation award for “Best Music Direction” in Tappin Thru Life; the 2009 Mary Lou Williams-Kennedy Center Lifetime Achievement Award, a 2013 State Department grant to tour Vietnam, a grant from Meet the Composer and a Doctoral Fellowship from New York University. The DIVA Jazz Orchestra’s most recent recording is, “25th Anniversary Project” (2017, Artistshare.) In 2019 FIVE PLAY released “LIVE” from the Firehouse Stage and in 2016 the 3Divas released their self-titled debut CD recorded “LIVE” at WVIA radio.